1 of 4 Unwrap candies. Heat oven to 350 degrees F.
2 of 4 Beat butter, butterscotch syrup, brown sugar, and flavoring in a large bowl until well blended. Add eggs; beat well after each addition. 3 of 4 Stir together flour and salt; gradually add to butter mixture, beating until well blended. Let dough rest, refrigerated, for 30 minutes. Shape 1 level tablespoonful of dough into 1-inch ball. Roll in turbinado sugar. Place on ungreased baking sheet. Repeat. 4 of 4 Bake at 350 degrees F for 10 to 11 minutes per batch, or until set. 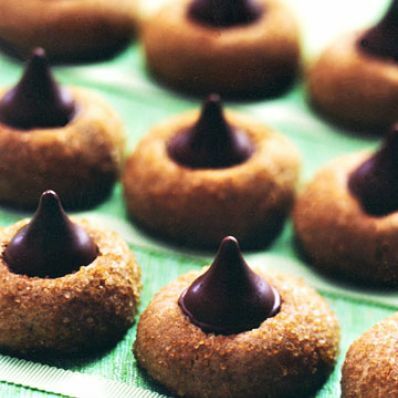 Gently press an unwrapped candy piece in center of each cookie; remove from cookie sheet to wire rack. Cool completely.